Happy Thursday, loves! Hope everyone’s weeks are going well. I’ve been feeling a bit under the weather, and am planning on taking it easy this weekend and making a ton of chicken noodle soup. Meanwhile, big things are happening: today I’m guest blogging over at Oh Sweet Basil! When Carrian asked me to come up with a delicious dessert for OSB, I knew brownies were the only option. Brownies practically run through my veins. 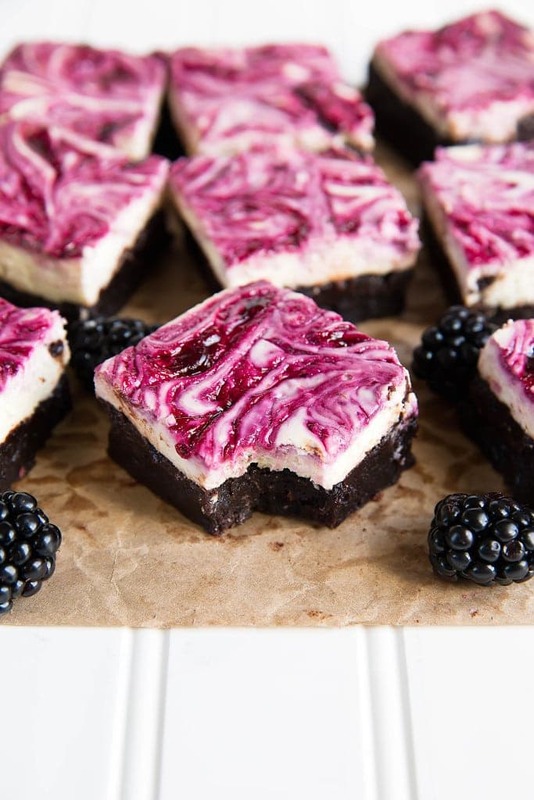 So I concocted this recipe for Blackberry Cheesecake Brownies. 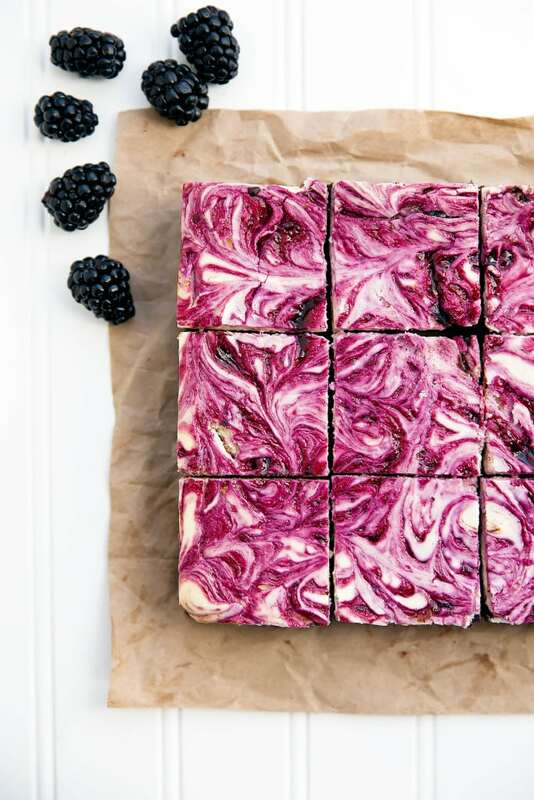 Think dense, fudgy brownies topped with tangy cheesecake and swirled tart blackberries. Even in my bed-ridden state I’m getting hungry just thinking about them. Plus, how summery are they? I need a little sunshine right now. Thankfully these brownies bring a few rays into my life, or at least onto my tastebuds. These cheesecake brownies require only basic ingredients you already have in your pantry. Before mixing together the brownie batter, you first need to make the blackberry puree that’ll be swirled on top of the cheesecake layer. Simply heat blackberries (fresh or frozen) on the stove with some sugar and water until the berries are broken down. Pass the mixture through a strainer and set aside to cool. Then, it’s on to the good stuff (aka, the brownie batter). I’m sure you’ve made brownies a million times before, so I won’t bore you with the details here. Pour the brownie batter into a baking dish, and then prep the cheesecake layer. I’ve used both cream cheese and Greek yogurt in this recipe to make the cheesecake extra tangy and flavorful. Be extra careful when spreading the cheesecake on top of the brownie batter. You don’t want to use too much pressure when distributing the cheesecake mixture, or you run the risk of mixing the two layers together. 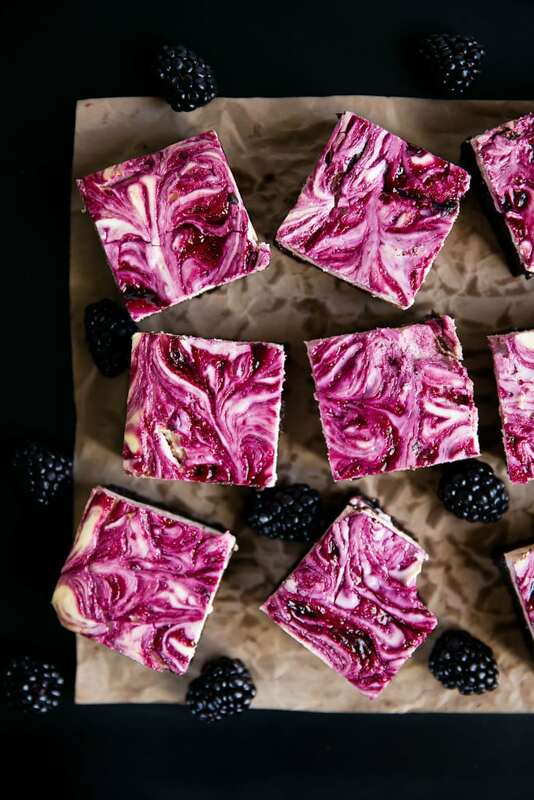 To swirl the blackberry puree into the cheesecake, dollop the mixture onto the cheesecake and then use a toothpick or knife to create a nice pattern. These babies can be stored in the fridge for up to five days, or you can freeze them for up to three months. Just keep in mind that cheesecake has a tendency to sweat when it’s removed from the freezer. Your brownies will still taste delish, but they’ll be a little damp on top. Be sure to head on over to Oh Sweet Basil for the full post and recipe! And if you have any stellar suggestions for how to make the best chicken noodle soup ever, do let me know. Hope you all have fabulous weekends. 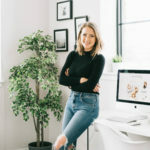 Can’t wait to share my Monday post with you! Cook blackberry puree by combining all ingredients in a small saucepan over medium-high heat for 8-10 minutes. Use a whisk or spoon to help break down the blackberries. Once cooked, place a fine mesh strainer over a small bowl and, using a spatula, squeeze through all of the liquid and dispose of the solids. Let cool to room temperature. 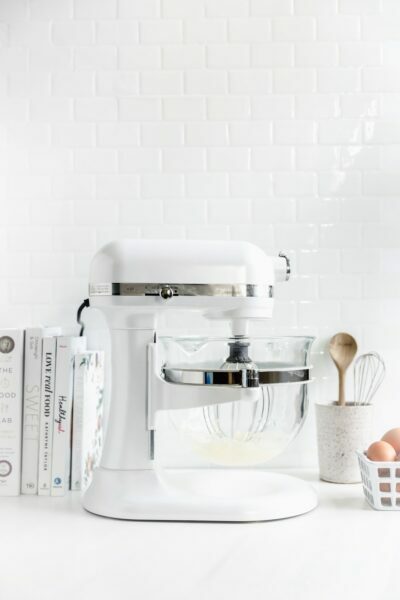 Combine all cheesecake ingredients in a standing mixer fitted with a whisk attachment. Cream for 2-3 minutes on medium-high speed. Pour over brownie batter, spreading evenly to the edges. 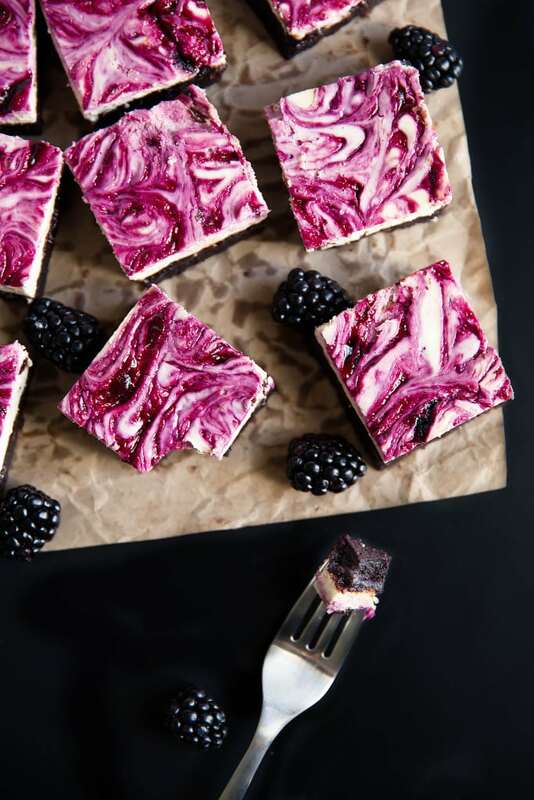 Drizzle the blackberry puree on top of the cheesecake batter and swirl using a fork, knife, or toothpick. Try to swirl only into the cheesecake batter, not the brownie batter. These are gorgeous! That COLOR! I hope you feel better love. Hugs! I hope you feel better, Sarah! And thanks for sharing my soup, hope you love it if you try it! These cheesecake brownies are so beautiful! I can’t stop staring at that pretty purple color. And I’m loving the mashup of cheesecake and brownies. Sounds amazing! What a flavor combination — and they look so moist! Hope your chicken soup turned out as well! These look to die for! I hope you feel better, if not, then just eat all of these? That would cheer me up ASAP. Feel better soon, Sarah! These bars are absolutely swoon-worthy! Between the chicken noodle soup and the brownies, I know I’d be feeling better! These are totally gorgeous! I can’t even STAND how gorgeous these are! Seriously I will be pinning these all over! Such beautiful colors! I’m mesmerized by these tiny, bright squares. Such an inspiring recipe. Cannot wait for fresh berries in the summer – vibrant, beautiful berries. These bars are intoxicatingly mouthwatering! YUM! So glad to have stumbled by! I will eat mine straight 🙂 Some women I know love their chocolate in any form (esp. certain times of the month or feeling down), but if I want chocolate, 9 times out of ten I want fudge (and walnuts preferably) brownies (the other time I want something milk chocolate and hazelnut). 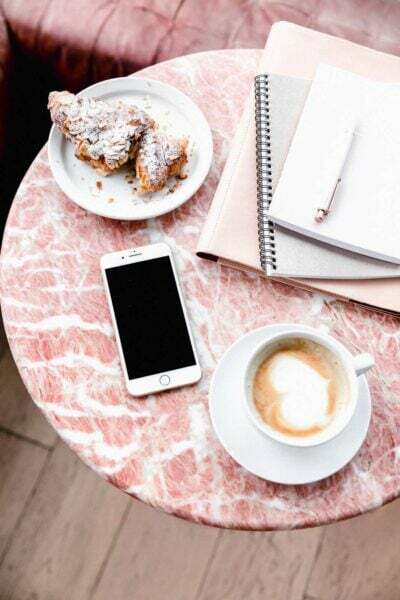 These are next up on my to try list – thanks for sharing! PS – since over a month has gone by I hope you are feeling better now. I am feeling better, and thank you so much for asking. All of your comments are making my day. Enjoy the recipes and happy baking! Hi Cheryl! 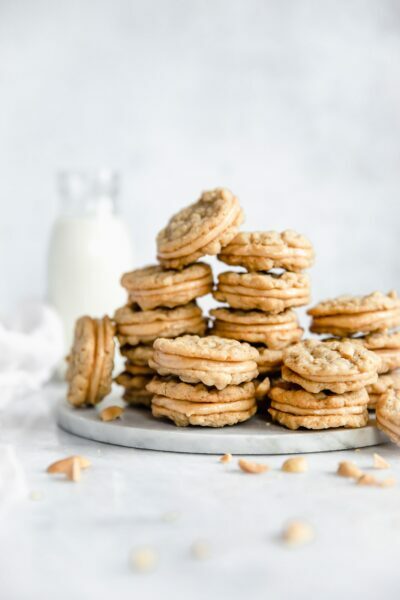 There is a link to the recipe at the bottom of this post. Just click on where it says “Oh Sweet Basil” ! 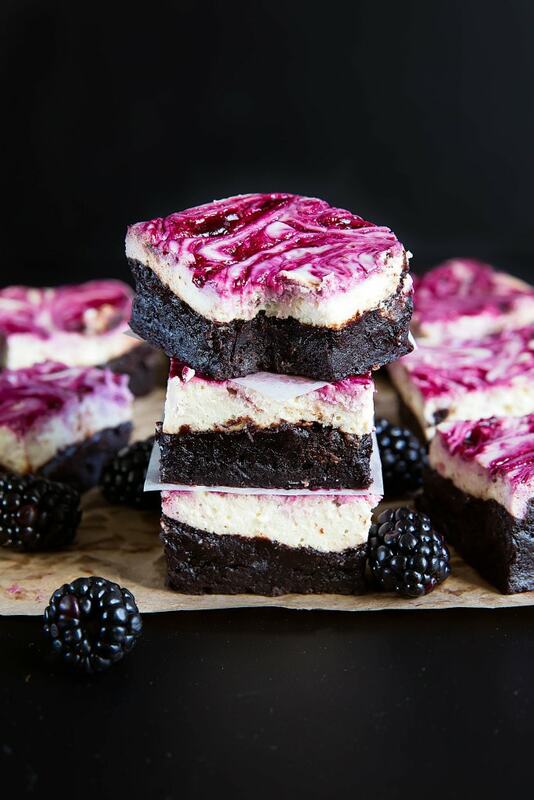 I can’t find the recipe for the blackberry cheesecake brownies. I know I am missing something, but we really want to try it. Hi Deana! I did this recipe as a guest post on ohsweetbasil.com, meaning instead of putting the recipe on my site, I put it on hers! The link to the full recipe is here. I am confused, I thought there was a recipe for these…did I miss it? Hi Craig! I did this recipe as a guest post on ohsweetbasil.com, meaning instead of putting the recipe on my site, I put it on hers! The link to the full recipe is here. I followed the recipe as written but my brownies were not fudgy they were raw, and in my attempt to cook them longer I lost the beautiful blackberry cheesecake coloring. Any tips for the next time I try and attempt? Thanks! Hi Cecilia! I’m sorry to hear that happened. My guess is that your oven temperature was probably a bit off. My suggestion for next time is to pour the brownies into the pan, cook them for 15 minutes, then take them out and carefully pour the cheesecake mixture on top and swirl it. This will allow the brownies to get more cooked without overcooking the cheesecake layer. Hope this helps and happy baking! So pretty! Love that color! So pretty! Love the color from the blackberries! These look so good! Can this be done in a brownie pan or cupcake type pan, if so what would the cooking time be please. I so want to try these they look amazing. These are made in a brownie pan– time should be the same! These look most delicious and I would love to try them; can you do them with raspberries, too? I don’t suppose you could estimate how much a cup would be in measurements, would you – say if you were using scales? I’m British. 😛 Look forward to trying this; thankyou so much for sharing. Hi Ellie! Yes, you can absolutely use raspberries! As for cups, it will vary by ingredient. There are many calculators online that will convert these things for you. Sorry to say I don’t know of them offhand! Hi Daniela! There are different types of cocoa powder, and they greatly range in terms of color. I highly recommend Rodelle’s cocoa. It’s the only cocoa I bake with! This sounds very good and I want to try it for my aunts birthday this week. Could you tell me how high the bars will be? I’m afraid they won’t fit in the backing dish I have. Hi Lena! They will be pretty high.. about an inch and a half, maybe? You will need a deeper baking dish, but not too deep! These look beyond amazing! Your photos are beautiful!!! All and all this is an amazing recipe. My husband just said this cheesecake was the best thing he’s ever eaten (not an easy feat to accomplish) and I am now planning on stockpiling blackberries so I can make this all the time. Thank you for the wonderful recipe! This was so delicious. I fed 13 people and they eat in a lot of smart places, and they all said it was the best dessert they had had for ages. The combo of fruit.chocolate sounds odd but it was perfect. I made it with gluten free flour mix, worked well.